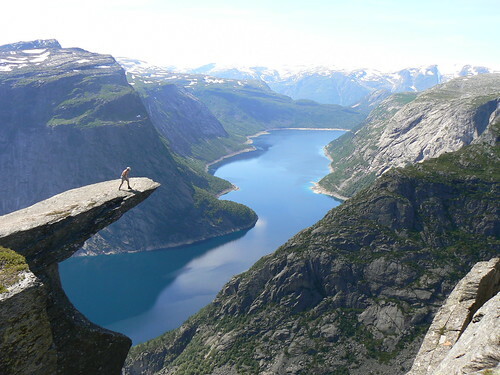 Trolltunga (meaning: troll's tongue) is a piece of rock that juts out horizontally from a mountain above Skjeggedal Valley, Odda, Norway. 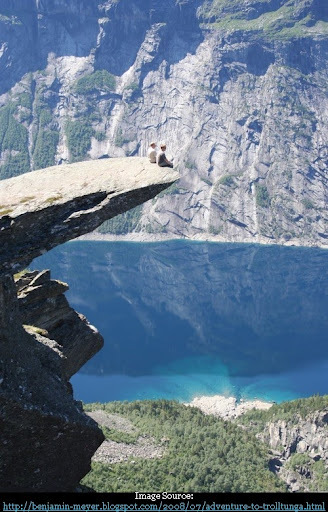 Only brave heart's have the courage to stand or sit on edge of this outcrop, which has a sheer vertical drop of 350 meters to the waters below. There are both stairs and a path that leads upto the first 950 meters, and from there marked hiking trails have to be followed to reach the spot. Previously a funicular railway at the base of the mountain used to take visitors to a height of 960 meters high with a 42 degree angle slope. It is reportedly not functional now. Click on the image to get the fantastic and breath taking enlarged view. 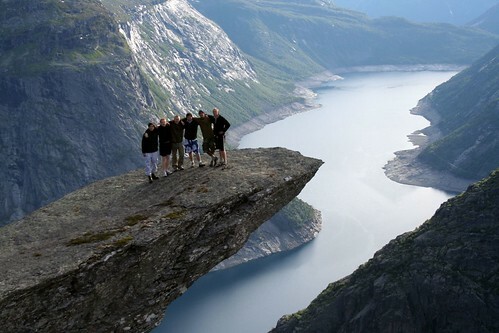 Source of info and more info: Wikipedia and Benjamin Meyer's Blog - A good description of trip to Trolltunga. Hi Miki - this amazing rock is in Norway and exact location can be seen in Google Earth / Google Maps by clicking on the link given in my post.